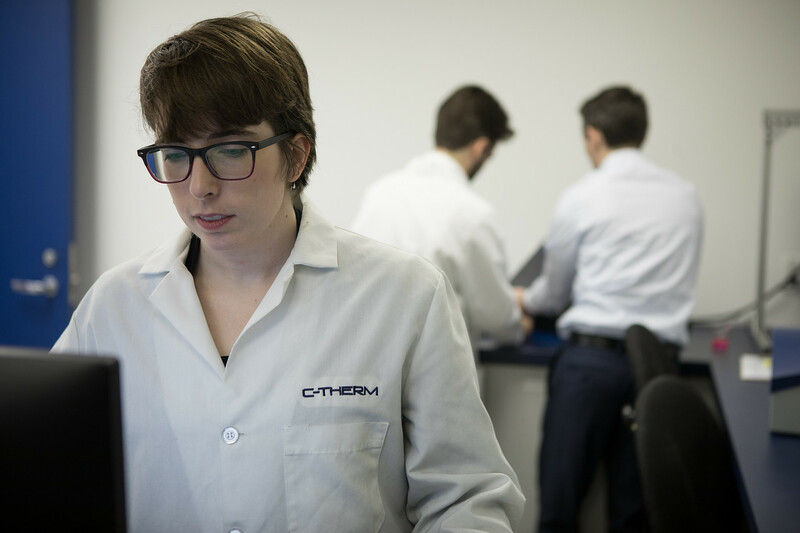 C-Therm is the global leader in high-sensitivity thermal conductivity testing services. Learn more about what thermal conductivity is and how to measure it. Thermal conductivity can be determined using either steady state or transient methods. Steady state methods require the entire sample to be in thermal steady state during the measurement. Transient methods do not require steady state. In both methods, the sample must be in thermal equilibrium with its surroundings prior to beginning the measurement procedure equilibrium. Consequenty, this means that steady-state methods can have much longer thermal equilibration times, even days, for completion of a single test. While steady-state approaches provide high precision and accuracy determinations of the thermal conductivity of a sample, the combination of very long test times with certain other drawbacks in steady-state methods has largely caused them to be supplanted, at least for routine measurements, by transient techniques. The Guarded Hot Plate Method is traditionally a primary steady-state method for thermal conductivity measurements (ASTM STP 879; ASTM C177-13). It is a proven, effective method for characterizing the insulation quality of materials (e.g. R-Value). 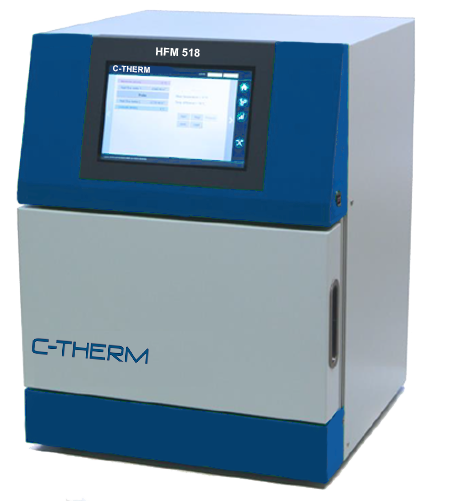 C-Therm offers steady-state testing with its C-Therm HFM 518. The instrument is particularly well-suited for insulation and building materials. The effective thermal conductivity range of the instrument is 0.002 W/mK to 1 W/mK. Unfortunately, certain requirements of this method limit its broader application as a routine analytical method. The sample must be at thermal equilibrium during the measurement. Combined with the fact that the test often requires very thick samples, this can produce exceedingly long testing times which inhomogeneities in a sample can prolong even further, particularly with very high porosity materials such as aerogels. Acceptable measurement accuracy requires a sample with a large ratio of area to thickness that is flat and parallel within limits defined in ISO 8302 resulting in very exacting sample preparation. The method is ill-suited for higher thermal conductivity materials (e.g. metals), liquids, pastes and powders. Transient methods have become the preferred approach to thermophysical property measurements, especially for routine laboratory testing and for field or in-situ evaluations. In transient methods, the heat source is applied in a periodic manner or as a pulse rather than continuously, as in steady-state methods. Since the measured thermal effects are transient, these methods do not require long thermal equilibration times, resulting in dramatically shorter test times for transient vs. steady state methods. Additionally, the extremely short test times allow less opportunity for the interference of other heat-transfer mechanisms, such as radiation or convection, which avoids the need for complicated experimental design to avoid parasitic heat losses. 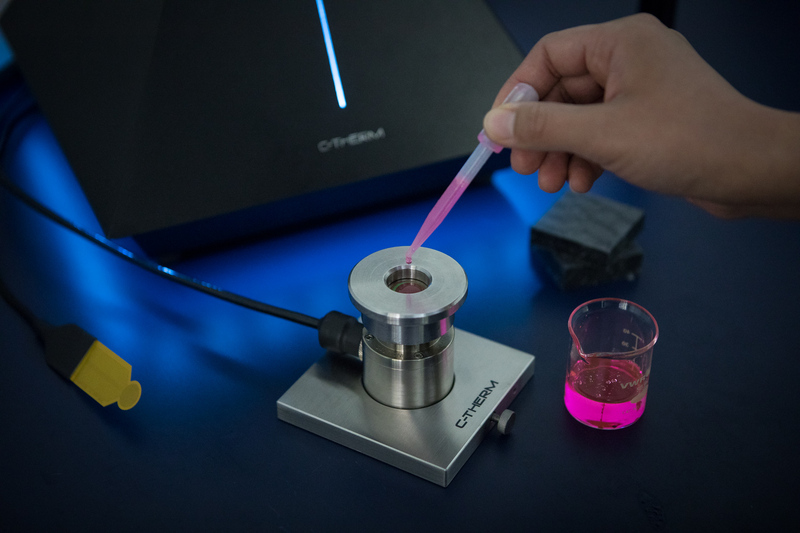 Short test times also mean that there is less opportunity for the redistribution of any volatile components within a sample, producing a measurement that is more representative of the material in its unaltered state. 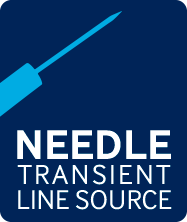 Transient methods typically do not require multiple temperature sensors; this reduces errors due to thermal contact resistance between the sample and the temperature probes. Finally, the equipment required for transient measurements is relatively small. This means that it can easily be designed into a portable unit for field measurements and keeps sample sizes both cost- and space-effective. C-Therm offers a variety of transient methods for measuring the thermal conductivity of a broad range of materials. This C-Therm patented technique provides a rapid, non-destructive thermal conductivity measurement featuring high accuracy and precision. The single-sided, “plug & play” sensor is suitable for testing solids, liquids, powders and pastes. The method offers maximum sample versatility. The method is not suitable for thin sheets of metal or for operation above 500 deg Celsius. The method employs a contact agent in testing materials of higher thermal conductivity (similar in principle to how ASTM C-518 employs contact agents), in negating the impact of contact resistance. The method conforms to ASTM D7984 in additionally measuring the thermal effusivity of the material. Effusivity is the thermo-physical property which relates to a meteria’s ability to transfer heat with its surroundings. A flexible double-sided “hot disc” sensor, available in different sizes, is positioned between two like samples of the material being measured. 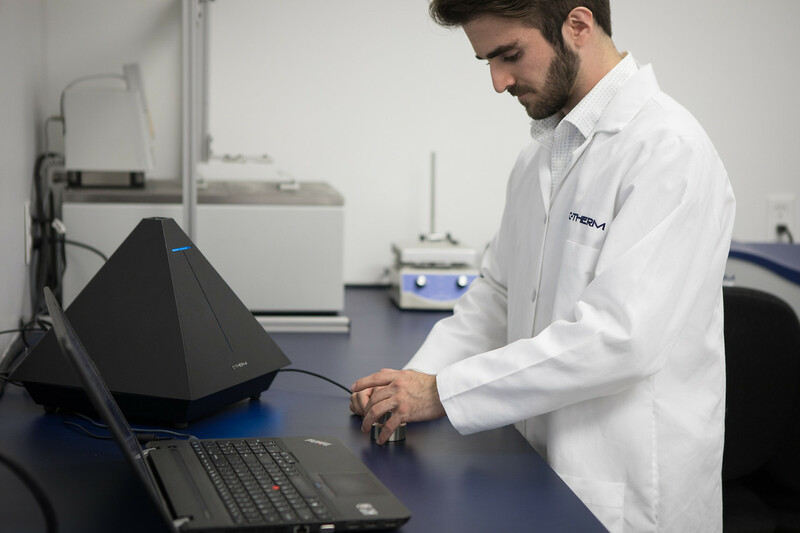 Greater control over experimental parameters makes TPS ideal for more advanced users, but can result in wider distribution of results as the measurement is dependent on the user-developed estimation of the suitable timing and power parameters. In addressing the issue of contact resistance, significant clamping pressure is applied to the sample stack. 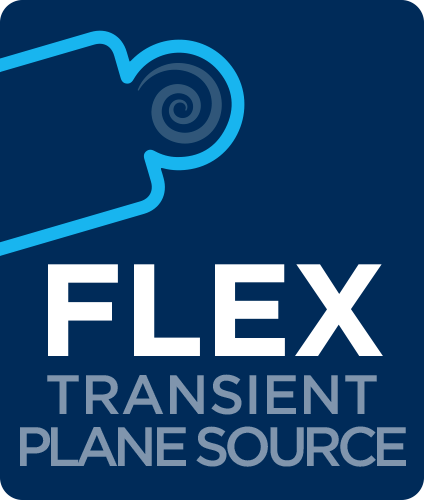 This can result in a significant bias for compressible materials where the densification of the sample impacts the effective thermal conductivity. The method does however offer specialty capabilities for slab (e.g. thin metal sheets) and anisotropic testing. Conforms to ISO 22007-2. The method additionally provides the measurement of thermal diffusivity. Sheathed in stainless steel, the TLS “Needle” sensor offers maximum robustness in thermal conductivity testing semi-solid samples. The test method is restricted to a more limited range of materials. The test method conforms to ASTM D5334 and D5930 for testing soils and polymer melts respectively.